The body type of the Japanese Bobtail cat breed is semi-foreign. This means that the body is long and muscular with long legs and narrow chest. The long legs give a square appearance to the cat when you look at it from the side. The head of the Japanese Bobtail cat breed is long and fine boned and forms a beautiful equilateral triangle (excluding the ears). When you look at the head in profile, it is gently curving and there is a definite stop between the high cheekbones and the muzzle. The nose is long and well defined. Even from the side the slanted eyes look very Japanese, and not the same as with other oriental breeds. The Japanese Bobtail cat breed has a head that is almost petite appearance with the huge eyes, but the ears balance the whole appearance. There are definite whisker pads. It really is a delicate looking, beautiful head. 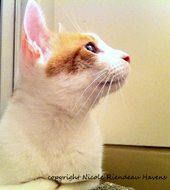 The ears of the Japanese Bobtail cat breed are large and upright. They are set wide apart on the corners of the head and the outer edges of the ears are parallel to each other. If you look at the ears from the side, they are tilted forward. The eyes are large, slanted and oval with a definite oriental look and they are clearly slanted from the side too. They are set wide and should not bulge beyond the cheekbone or forehead. Odd-eyed Japanese bobtails are especially valued, as are the beautiful blue eyed ones as well. The expression is bright and alert. The muzzle of a Japanese Bobtail cat breed is broad and rounded. It should not be blunt, nor square or pointed. The chin is firm, full, and in line with the nose and the upper lip. The neck should be in proportion to the rest of the body. The body itself is small to medium in size. The average Japanese Bobtail weight is 6-9 pounds (2.7 – 4 kg). The torso is long and straight. This is a slender cat, not chubby like a Manx can be. The overall appearance is cleanlined, lean and elegant. The body is angular, muscular, balanced and straight. There is no coarseness in this slender cat. The legs of a Japanese Bobtail are long and slender. The hind legs are longer than the front legs but when the cat is standing at rest the hind legs are deeply angulated under the cat’s body and this makes the back look straight – it does not rise towards the back. The paws are refined and oval, not overly delicate looking. And then comes the defining feature of all Japanese Bobtails – the tail. It is different in every cat. Someone has said it resembles a chrysanthemum bloom – a fitting symbol for an imperial Japanese cat. Each Japanese Bobtail has a tail – there are no tailless kittens. It is caused by a genetic mutation – the gene is recessive. If both parents are bobtails, all of the kittens are too. You could call the Japanese Bobtail a partially tailed cat. This “pom-pom” gene does not cause health issues to the breed as it may do in the Manx. The tail is clearly visible and has one or more curves, angles or kinks in it. It may even be a combination of them all. The small joints can be fused, but the tail can be flexible also. The direction of the tail is not important in the breed definition. But in all cases the tail structure is covered with fluffy hair (if the cat is long haired, then of course the hairs of the tail are longer too. This “pom pom” tail is quite cute looking – and about 2-4 inches (5-10 cm) long, but because of the curling it looks shorter. The furthest extension of the tail bone should be no more than three inches from the body. The tail is very sensitive to handling thanks to the fused bones, so do handle it very gently and never try to straighten it. Many Japanese Bobtails know how to wiggle their “rabbit tail” from the base. People who are owned by the Japanese Bobtail affectionately call this little tail as pom pom, hook, corkscrew, shaving brush and (my favorite) the teacup handle. The coat is soft and silky to touch, of medium length and flat. A Japanese Bobtail does not shed excessively, because it has no undercoat, but it does need some grooming at least once a week. Like other cats, the Japanese Bobtail sheds seasonally, so more grooming is required during these times of the year. The cats chosen for the breeding are silky-coated (some say the coat should give the impression of porcelain). Still in their native country there are Japanese Bobtails with thick coats – especially in the North where the climate is more harsh. Longhaired Japanese Bobtails are more rare, because both parents need to carry the recessive gene that causes the longer hair. And even then only a third of the kittens have long hair. The long haired version of the Japanese Bobtail had medium to long hair that is shorter on the shoulders, lengthens towards the rump. It is much longer on the tail which shoud remain fluffy even in summertime. This cat also has clear britches on its back legs. The hair on its tummy is also longer. It is preferred for a long haired JB to have a ruff around its neck, at least in wintertime. This ruff can be of coarser hair and may even look a bit shaggy. Ear and toe tufts are desirable. 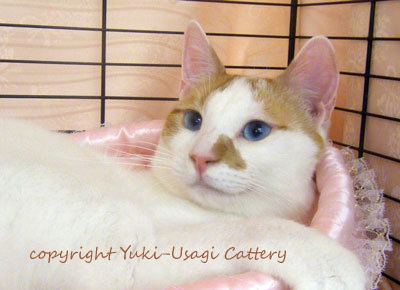 A Japanese Bobtail can be of almost any color, but what ever the color, bright colors are favored. Siamese of Abyssinian agouti colors are not permitted. Also you won’t find a solid lilac or chocolate JB. The most favored color of Japanese Bobtail cat breed is the calico, or “mi-ke” (“three fur”): the base color is white with red and black patches (the red patches may have tabby stripes of spots). It is favored by the Japanese because they believe it brings good luck. The original famous Maneki Neko cat was a mi-ke. Most mi-ke-colored bobtails are female, because the genes giving black and red color simultaneously must be two X’s. If a male cat is mi-ke, it would need to have two X-choromosomes (XXY instead of the normal male XY) and this occurrence is very rare. Usually male “calicoes” (if you really can use that term) are white and black or white and red. There are dilute mi-kes as well. Also torsoiseshells, tabbies and patterned or smoke JB’s. Tabbies and dilutes are more rare. The Van-pattern is common. If a Japanese Bobtail has lots of white in its fur, it can have blue eyes, or even odd-eyes. If a JB is of solid color, the color should be uniform everywhere – from each individual hair to the whole cat. White should be pure white (remember the porcelain effect), black should be a deep, pure black with no red hues. Red should be a deep, rich red. If the cat is blue, a lighter shade is preferred. And a cream-colored Japanese Bobtail should be of buff cream color. The nose leather, paw pads and eye colors should be in harmony with the coat color. Among the coat colors of the Japanese bobtail cat breed there is one special color that is considered even sacred. If the cat is white with a black spot on its back, it is called a Kimono cat – it resembles a female figure in a kimono. 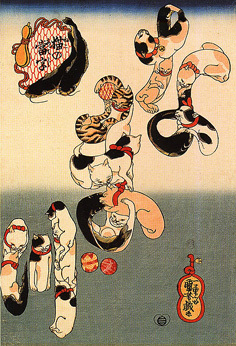 In Japanese mythology a cat that has this special pattern if believed to hold the spirits of the ancestors. These cats were often taken to the safety of temples to ensure their well being and survival. The Japanese Bobtail cat breed has a definite look of its own – personal, strong but lean, and a very beautiful head and expressive eyes. A true beauty of the cat world. Click here, if you are looking for a Japanese Bobtail cat breeders. And you will find Japanese Bobtail rescue organizations here.